Flatout Foldit Soft Pretzel Artisan Flatbreads…whoah. Mind = BLOWN. I have always been in love with soft pretzels, and I’ve always been a fan of Flatout Flatbreads. 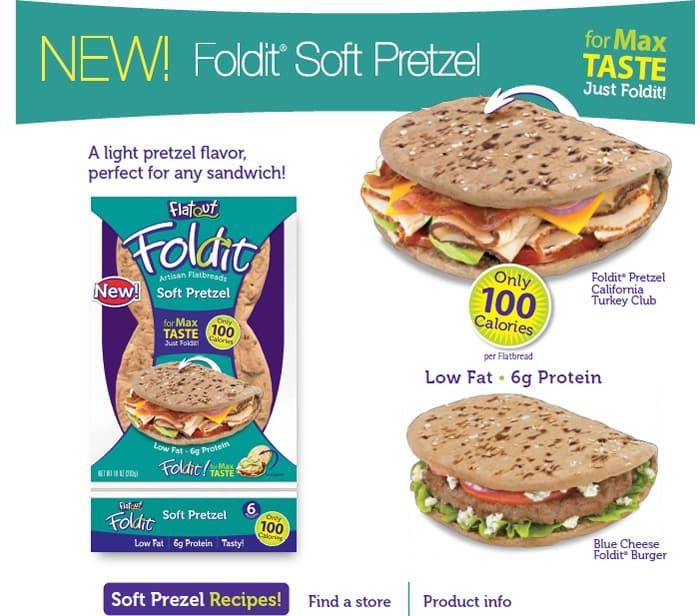 So when Flatout created these new folding, soft pretzel flatbreads, it was like my two best friends got married! I was so excited to try them! While it doesn’t taste 100% like a soft pretzel, it is definitely similar, and it offers a delicious new breading option for sandwiches, burgers, mini pizzas, and so much more. Flatout offers a variety of other flavors in their “foldit” flatbreads too, but the soft pretzel flavor is the champion. These figure eight shaped flatbreads offer a great way to quickly fold your flatbread, making it easier to eat without a lot of the yummy insides spilling out. Flatout Flatbreads have an amazing variety of flatbreads to cook with, but the new soft pretzel flavor just made me jump for joy. And at just 3 Points, these make a perfect addition to your favorite Weight Watchers sandwich recipe and much healthier alternative to high points rolls and breads.